Border guards serve about 4 cars per hour. 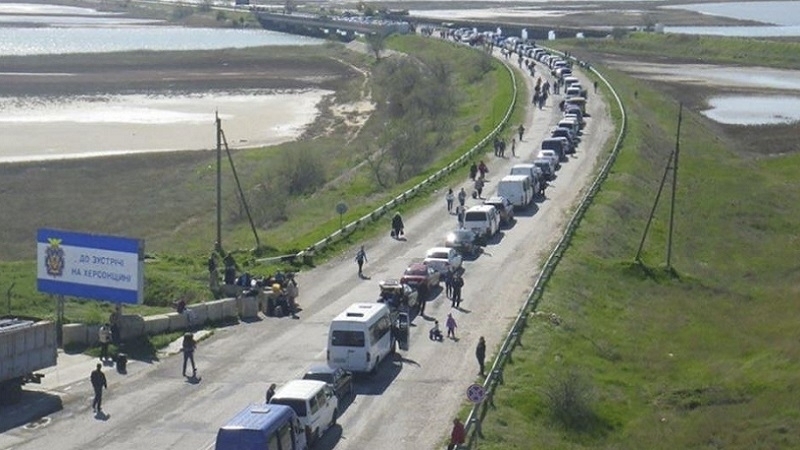 On Saturday, Russian services at the administrative border in the occupied Crimea again created queues of cars driving both from the mainland Ukraine to Crimea and from the Russian-annexed peninsula to mainland Ukraine. Assistant to the Head of the Berdyansk Border Guard detachment - the Head of the press service Nelya Dotsenko told about the accumulation of vehicles to a correspondent of Ukrinform. “On Saturday, a large queue of vehicles driving from mainland Ukraine to the territory of temporarily occupied Crimea was formed at the Ukrainian entrance-exit checkpoint "Chongar". As of 6:00, there were about 150 cars in this line. At 9.00 the queue slightly decreased - more than 120 cars, and as of 10.30 their number remained almost the same. But another fact attracts attention: according to citizens who are coming from Crimea to mainland Ukraine, this time Russian services at their checkpoint, which is opposite to one in Chongar, also created a line of cars going from the occupied peninsula to the mainland Ukraine. After all, in recent years, the occupants have provided slow access only in one direction - from the mainland of Ukraine to the annexed peninsula,” Dotsenko said. According to her, on Friday Russian services served about 7 cars per hour, and on Saturday - about 4 cars. Dotsenko also said that queues of cars for departure from the mainland of Ukraine to the Crimea are also observed today in two other checkpoints - Chaplyanka and Kalanchak. About 20 vehicles await entrance to the Crimea at the "Kalanchak" checkpoint, and about 10 cars in "Chaplynka".